The BOSTON SPORTSCAR Company is proud to offer Tubi Style Italian sport exhaust systems. 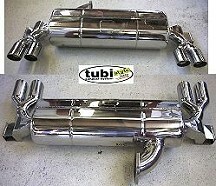 Tubi Style sport exhaust systems are hand crafted, stainless steel exhaust systems. They have long been the standard throughout Europe. Tubi Style has a long history of working side by side with top Italian marques meeting the demands of exotic production cars, prototypes, and super cars as well as the Ferrari Formula 1 team and the Momo Ferrari 333SP. At a small modern shop in Fiorano, Italy a team of craftsmen with artisan-like skills collaborate to build each Tubi Style exhaust system. Each system is built by hand using the finest materials and processes. Tubi Style exhaust systems are available for all Ferrari models, from the 330 GTC and early 308s to the 355 and the 550 Maranello. Construction begins on a specific jig. manufactured for each system. The material used both internally and externally is INOX 304 stainless steel. All welding is "TIG" welded with argon gas pumped into cambers and piping while construction is in process. This process prevents warping and insures strong uncontaminated welds. Flanges are fusion cast stainless steel, which hold their shape during assembly and throughout the life of the system. Exhaust gases are unobstructed through the system. This enables increased engine performance while preventing the compromise of excessive engine resonance. An internal lining of Isolmer mineral fiber with a fusion point of 1159 degrees Celsius will not deteriorate. This mineral fiber insulation is held in place with perforated stainless steel, eliminating migration of the minerals throughout the life of the system. Installation of the beautifully polished product is easy. Tubi Style exhaust systems are designed for direct installation onto catalytic-equipped automobiles. Tubi Style exhaust systems do not require any modifications to your Ferrari for installation. They are designed for easy installation to O.E.M. mounting points. For more information, call The BOSTON SPORTSCAR Company at (781) 647-7300 or visit the Tubi Style website at www.tubistyle.com.